'June twenty-first!' I can hear Pablo proclaiming the date, just like that, in his raspy little boy voice. If he were here to talk to me... Holy smokes! I would smash this laptop and never come back. I'd see colors with brilliant clarity. I'd hear sounds reserved only for the divine. The ever-present tension in my jaw and chest would instantly melt away. Most of all, I'd have someone to protect. Someone to complete me. If Pablo were here, I'd be a parent again. 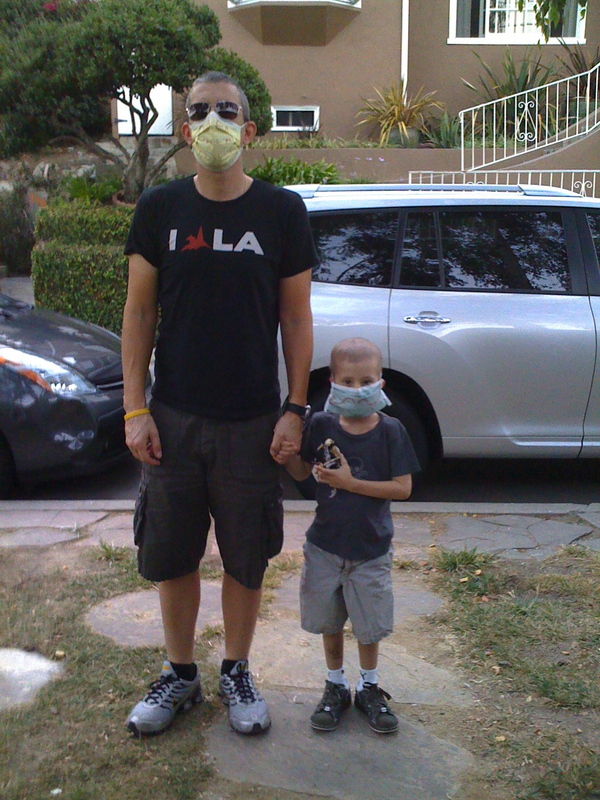 Nine years ago, with a contracting Jo Ann in the passenger seat, and a young nine-year-old Grady in the back seat, I sped down Silverlake Boulevard, gliding over every bump and knot in the road, making our way to the relatively smooth pavement of Beverly Boulevard and its straight shot to Cedars-Sinai Hospital. A few hours later, a little ball of humanity was born. We named him Pablo. Not only because we had decided on that name, but because it was clear to us that he was just...PABLO! When we met him, it was that simple. Pablo. The following 2,196 days were the best of my life. Pablo gave me a reason to live, and to be in life. From the moment he was born, Pablo was my best friend. He brought joy into my life... Slowed me down... Taught me to breathe, and focus on what's important... His very presence in a room made me feel complete. One of my favorite things was picking him up at the Walther School, where he would jump into my arms when he saw me, and we would sit on the sofa and read. We had fun, always. We had our own lingo, and we didn't care how goofy we sounded. It was our thing. The 1100 days since Pablo's death have been filled with many things: indescribable emptiness; feeling around in the dark for signposts; a joyful glow watching the The Pablove Foundation blossom in the world; self worth that seesaws between Mt Rushmore and the gutter; physical fitness and a waistline that seesaws much too much; a nonstop longing to belong. All that, plus a relentless professional life at Dangerbird. A life I have chosen, or has chosen me, that is big and constant and sometimes fun. My statement about fun isn't an insult to those around me who have fun: unfortunately, when your child dies, all the things clinicians tell bereaved parents they can expect come true: 'empty arms syndrome' (a longing to physically hold your child); a loss of purpose and self worth (after all, parenting is the most important 'profession' life has to offer); intense blankness when others around you experience joy. The list goes on...and grows every day. Parents know that as we get older, our children quickly become the answer to the Great Why. They become 'the reason' for everything we've built, and the reason for sustaining it all—to provide, protect and remain present for them, so that they may have a better life than we had. Consequently, this mad dash to stay in the rat race is nourishing to the soul. By turns, the loss of a child is utterly disorienting to the rat racer. If you've ever been caught in a snowy white-out (being from Milwaukee, I have), you have only a 5% clue what I'm talking about. Snow whiteness is much easier than soul whiteness. That is all I can tell you. And I hope you never find out what I'm talking about. Today, six months after my 40th birthday, I sit at a crossroads in my life. I hobble into each day with my fractured heart. I try my best to look, sound, feel normal. Some days are great. Some days are agonizing. Having endured the loss of Pablo in 2009 and my brother Scott in 2004, I am never ready for the instability I face in the music business. For a start, those of us on the front lines of the music biz are living through a trauma at the moment. Its unpredictable nature mirrors exactly the unknowingness I felt as a cancer dad. (Note: I chose the above photo to illustrate this common trauma: Pablo faced one in 2008, I face one today.) Never knowing whether any number or scenario can be trusted is often a rollercoaster I want to jump from. I'd imagine my friends in TV and film feel the same way these days. Having dedicated my entire adult life to advocating for others in the field of music, I don't know anything else. Besides, I'm decent at what I do after 20-plus years in the field. Where all of this is leading is here: I can feel myself wanting to narrow the scope of what I do, focusing on things that bring joy and satisfaction to me. Not because I am not smart, not cool or careless, but because I'm not sure I can volunteer to suit up for yet another cosmic war. I've fought enough of those in my short 40 years on this earth. When things go well there's no better feeling. Seeing large groups of people mass up around small groups of people who pour their guts onto tape for all the world to hear is life-affirming, sacred stuff. In a general sense, I know I'm not alone in this. Seems everyone I speak to is somehow examining their professional life these days. The neighborhoods populated by creatives all over the world today are faced with challenges wrought by worldwide economic uncertainty and the ease with which people can consume our output with little or no benefit to the creator or their backers. It's an unfair game, with an invisible opponent, just like cancer. So, on this day, my deceased son's ninth birthday, in this open letter to the world, I proclaim that I will continue to do my best in life and in business and in the work of The Pablove Foundation. As I point my heart in the direction of Pablo, and hope for some sort of luck, some sort of a break, for the remainder of my days here on this hot, bizarre planet, I can guarantee only one thing: The best I can do is the best I can do. My love to you and yours. Hug a kid today. Hug a friend today. Tell someone(s) you love them. Make it real. Now, not later. Meeting Pablo on that floor, well over 3 years ago, was and continues to be,one of the greatest blessing in my life. I love you all.And my love for Pablo, my own child and all those who have and will travel this unspeakable road, propels me daily "do" something. Anything, to honor their precious lives. I thought of this quote today. Sad. True. Appropriate. I've met your son a million times through your words.... thank you! My whole family knows Pablo. As i just announced to them that today is his birthday everyone said, "Awww, Pablo I remember him"
Happy Bithday Pablo. You are all in our hearts and thoughts, as always, eventhough we never met. You just never forget a story like Palbo's. And you family's. Keep giving it your all, the best of you as you said. As I read your blog, I know exactly how you feel. We also lost our son, Max, to cancer in 2009 and he "turned 9" on June 2. We are coming up on the anniversary of his death, July 4th, my least favorite holiday. I attended an event in honor of Pablo hosted by Julie Dennis a few weeks ago and it was marvelous. She brought honor to Pablo in such an amazing way. We have also started a foundation, MaxLacewell.org, so I also know what it's like to watch a huge group of people do something amazing, over and over again. It certainly is divine. I just wanted to say Happy Birthday to your sweet Pablo and know you are not alone in all of this, although sometimes it certainly feels that way. May God bless your family and give you peace. This is a beautiful "open letter" Jeff. It makes me feel many different emotions, having had a big job in the music business, having lost that job, having made a decision to help kids by becoming a teacher, recently having left that job... You made me realize that we can't be selfish all the time. I did my "missionary work" as one friend called it, but the work never ends, because even though I'm not a parent, there are a lot of kids out there who need love. Maybe I can't give it to them as an inner city teacher, but your letter made me realize, I have no choice, I have to figure out how to take care of myself and then give some away. We can only save the world, one little step at a time. Today, Pablo taught me that. Thank you for the message and your beautiful truth. This brought tears to my eyes, a truly honest beautiful letter.